For the nth time in (n+1) years, the Solicitors (Xanthe Ranger, Dan Blue (sub Paul Andrews), Tony Melville, Brendan O’Brien, and Richard Fawcett) defeated the Bar & Bench (Howard Mason, Mark Derham, James Guest, Stewart McNab, and Gavan Griffith). This year the margin was 7 matches to 3. 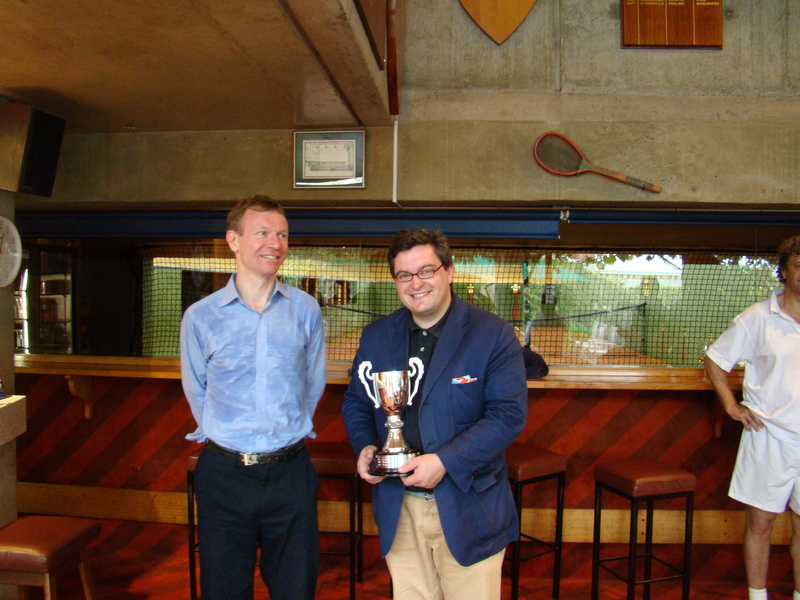 As per the accompanying evidence of my ongoing humiliation, it was my reluctant duty as non-playing ‘captain’ of the losing team to present the trophy to my counterpart Andrew Schnaider. 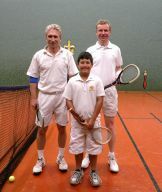 Julian Snow won the RMTC Gold Racket for the fourth time yesterday, beating Mike Happell in five sets, in what was one of the closest matches between these two long-time amateur rivals who first played against each other in Ballarat in 1988. It was a match of two halves. Julian lost the first two games, then won 12 of the next 13 to take a two set lead, dominating the cross-court backhand exchanges. Mike then switched from predominantly serving drag serves to a railroad, and also began to latch on to Julian’s ‘underarm twist’ version, to level the match. At 4-4 in the 5th it was anyone’s game as both players began to show their age: Julian was relieved to be able to find a couple of strong winners to clinch the title by a score of 6/3,6/0,4/6,2/6,6/4. Amy Hayball won the ladies club championship with an impressively strong victory over the holder, Laura Fowler, by 6/2,6/2. Amy played a very solid and mature game in the classic mould: serving predominantly a side wall then relentlessly probing Laura’s backhand corner when at the hazard end. Amy never let up for a moment and in the end was clearly dominant. Simon Carr was equally impressive in winning the U21 championship, 6/2, 6/0 over Paul Rosedale. Simon played fast and well, banging down an old-fashioned railroad and also concentrating on extracting errors out of his opponent’s backhand corner from the hazard end. (It was a pleasure for me to watch these young men and women not only playing so correctly, but also in a fine spirit). Charlie Mackinnon and Peter Stanley survived from 86 original entries to contest the club’s handicap singles final. Peter has had many epic victories on his way to the final this year, but his wife Anne & I both agreed that he didn’t quite show his best form yesterday; indeed Anne commented that Peter played ‘as if in a dwaal’ (a state of befuddlement, for non-Afrikaans speakers). Charlie, on the other hand, looking very fit, played several points ahead of his mark of nearly 47 handicap, and coasted to a 9/3 victory. The most exciting match of the day was the Medallists’ final between Sophie Jonhnson and Nick Shelton, off a massive handicap difference. Nick very nearly overcame huge odds, saving countless match points before being only two points away from victory himself. Sophie, on good terms with herself these days, kept the ball in play as much as she could and finally extracted an error from Nick to claim a well deserved win. I thank all those who helped make the tennis aspect of the day run well: the players, spectators, markers, referees, and ball-boy. This (nearly) concludes another successful year of tennis at the RMTC. Mike Happell defeated Kieran Booth last night, by a score of 5/6, 6/5, 6/3, 6/2. In the end Mike won well, and for the final portion of the match all his many qualities of precision and control, not to mentioned his unrivalled understanding of the RMTC court, were on display. Yet it was nearly a very different story. Kieran recovered from 3/5 down in the first set to win it 6/5, stepping up a level with some very aggressive play from the service end. In the second set, Kieran again recovered from 1/5 down to lead 40-15 in the 5 all game, poised to take a two set to love lead. He was attacking chase better than two, and played an awkward cross-court floor shot. Mike, however, resolute under pressure, judged precisely where it would fall and at the last instant withheld his stroke, as the ball narrowly lost the chase; he then went on to win the next three points to level the match. Having escaped that particularly tight spot, Mike’s confidence and shot-making improved markedly and he thereafter played beautifully to set up yet another encounter with his perennial rival, Julian Snow, on Sunday.